The classic wedding tradition of showering the bride and groom with rice as they leave the church after the wedding ceremony has taken on new incarnations in recent years. Sparklers, bubbles, bird seed and rose petals are among today’s popular choices. 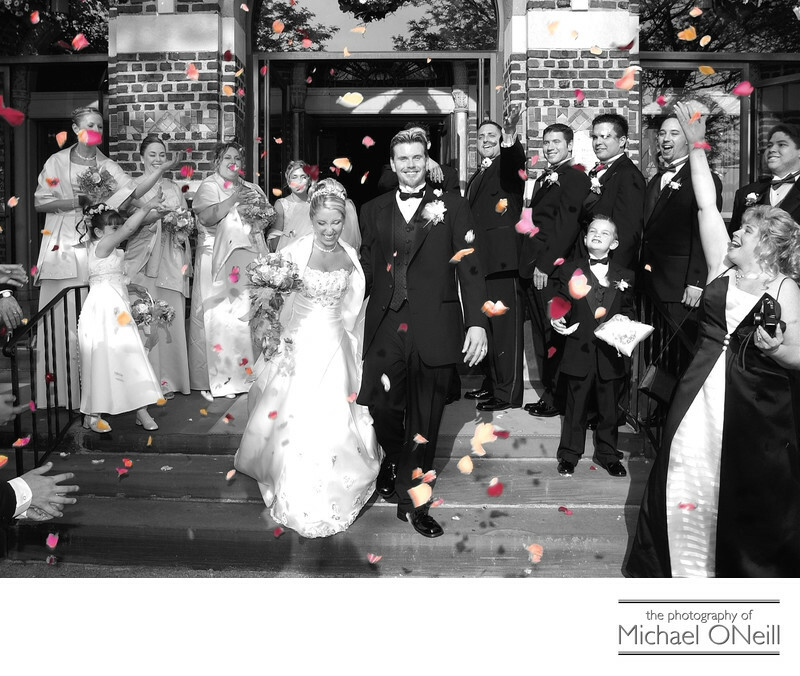 This wedding pic was taken outside of St. Joseph RC Church in Babylon Village on Long Island, New York. The couple was on their way to their wedding reception venue, The Glen Cove Mansion in Glen Cove, NY. Their bridesmaids, groomsmen, flower girl and ring bearer joined in with all of the wedding guests in throwing colorful rose petals over the couple as they left the church. The couple asked me to do a selective color print of this image for their finished bound wedding album. I converted the wedding photo into a classic black & white version and then digitally brought back the hues of the colorful rose petals. This is just one of the many digital image retouching and enhancement techniques that I employ when crafting a finished wedding album for my clients. When choosing the right wedding photographer for your special occasion be sure to sample their retouching and enhancement skills. In this modern digital age a photographer’s job is no longer finished when they push the button and your wedding photographer should be skilled with many different retouching and enhancement techniques to make your wedding photos look as amazing as they possibly can.